This tutorial was my contribution earlier this year for the series “Shorts On The Line”, when the northern hemisphere was heading into summer. 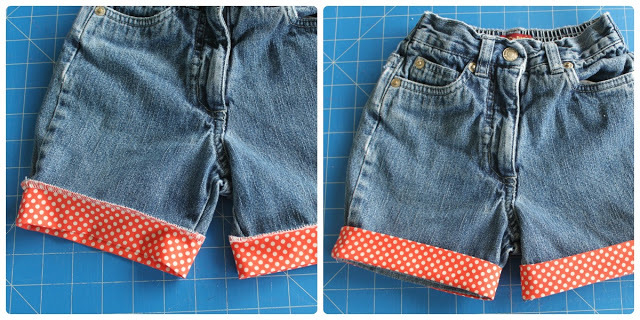 Now that all of us down south are enjoying spring and the promise of some warm days ahead, I thought now would be the perfect time to publish this tutorial here, so you can get sewing for summer! 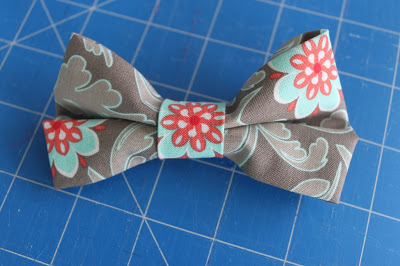 You could also make some simple changes to make this for a little boy – omit the bow and make the belt a bit longer. Then use a couple of D rings so the belt can be fastened. There are lots of simple D ring belt tutorials out there. Fold your jeans in half. Cut the legs off at the desired length (err on the long side – if you go too short, you can’t go back!) Measure around the cuff. 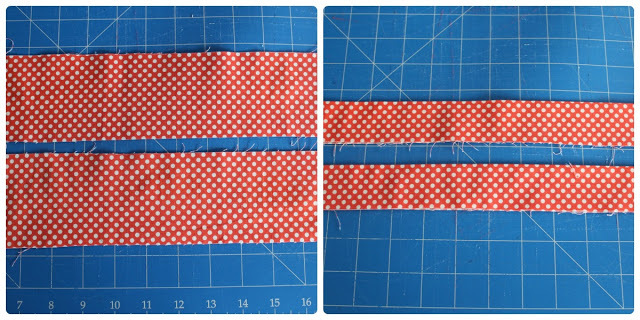 Cut your fabric the length of your cuff plus 1cm for seam allowance and 7cm (3″) wide. 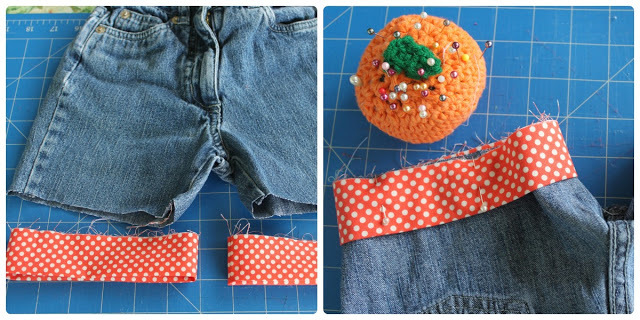 My jeans were a size 3 – if you are making these for a child or adult you may wish to increase the width of the cuff. Press in half. Sew short edges together to form the cuff and iron open seams. Fold back in half along the pressed crease. Turn jeans wrong side out and place cuff over each leg, aligning then pinning raw edges together. Sew all the way around each cuff. Serge or zig zag stitch as denim has a tendency to fray. Turn your jeans right side out and flip your cuffs up. A good press with your iron will hold the cuffs into their correct position. 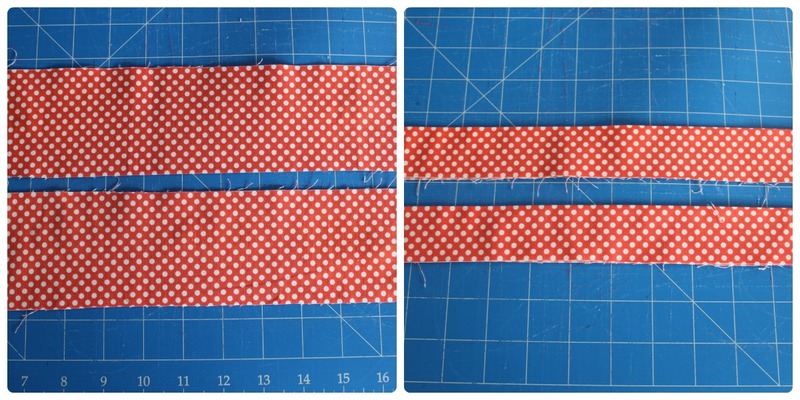 Measure the waist and add an additional 10cm (4″) for overlap. My fabric for the belt was 10cm (4″) wide. Cut your fabric strip, fold in half and press. Sew along the raw edge length. I used a 1cm seam allowance. 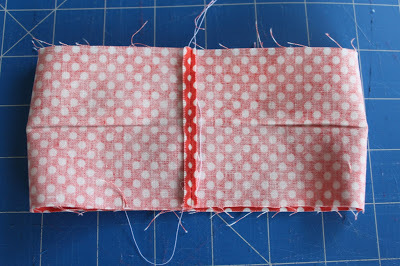 Turn inside out and press so that the seam is hidden along the pressed edge, Tuck the short raw edges in and press. Top stitch around the entire belt. Set aside. Press the long edges in as shown in the picture. Take the large rectangle and fold short edges in so they overlap. Pinch the down the middle to create your bow shape. Wrap the smaller piece around the middle of the bow to create the bow centre. Secure with fabric glue or pin and hand stitch in place. Your finished bow should look like this. If you would like it to be more sturdy, you can iron on some fusible interfacing to the main piece of bow fabric before you assemble it. 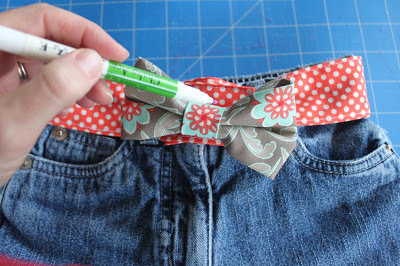 To finish off – mark your belt where you would like the bow to be situated, and hand stitch the bow to the belt. Mark the other belt end with where you would like your button hole to be, then sew a button hole, so the belt can be done up. Don’t be fooled by this very summery looking picture – despite the sunshine it was a frosty 10C (50F) during our photo shoot! My little model did a fabulous job but soon after this picture she gave up and ran straight for her polar fleece coat. If you refashion some jeans using this tutorial I’d love you to share! Tweet me, post a picture to my facebook timeline, send me the link to your blog or upload a picture to my Flickr pool! I love seeing what people make from my tutorials, it makes my day! 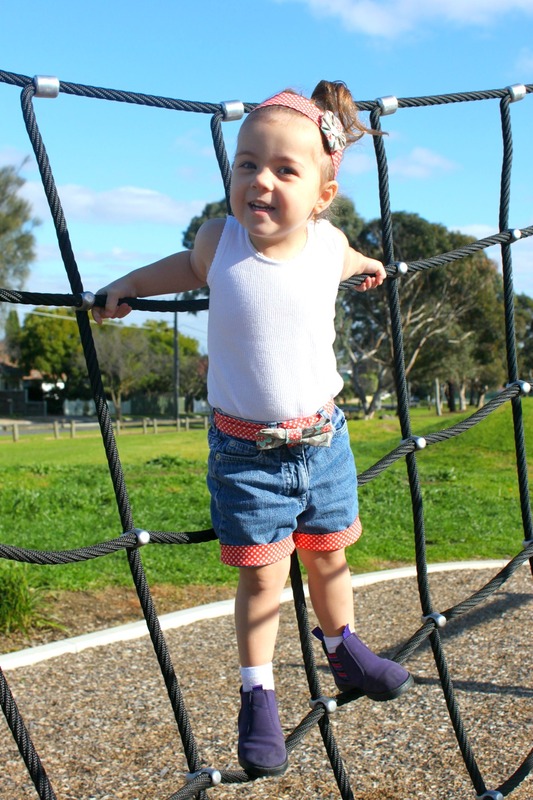 Kids often grow in height, without putting on much weight. 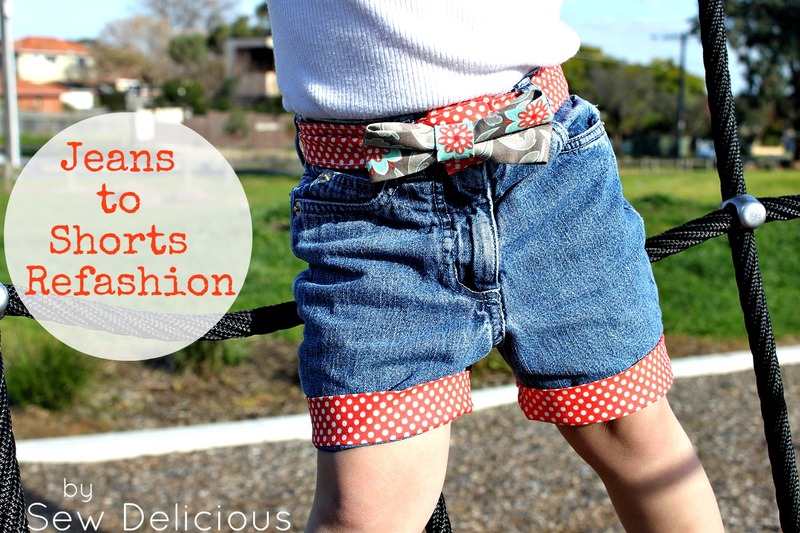 This is a great way to extend the life of too short jeans. They look so cute, Ros. Mega cute.. but can I get away with a pair? 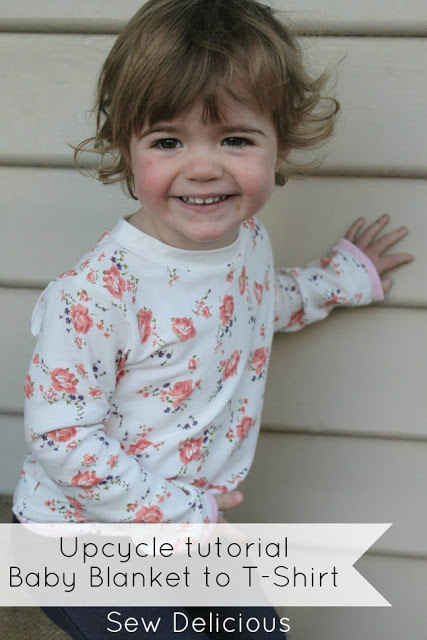 Too cute – until I saw the pic at the end I thought you'd made them for yourself! Totally different!! !Thanks for the idea.